The light purple tinge of early twilight shone over the horizon as the trout began to rise. Just as expected, the river came alive with a familiar rhythmic motion. A light pop here, a gentle sip there and the harmonic symphony of rising trout on the Kinnickinnic River near River Falls Wisconsin began anew. Although I could still hear trout feeding as the last light of day faded away I started the long walk up the canyon; another wonderful evening on the Kinni was over. The Kinni, as local fly anglers affectionately call the river, is a diamond in the crown of Western Wisconsin trout streams. A mere 40 to 60 minutes from Minnesota’s state capital Saint Paul, the Kinnickinnic maintains brown and brook trout populations up to an amazing 8000 trout per mile and has not been stocked sine 1974. Beginning north of Interstate 94 and traveling roughly 25 miles to the Saint Croix River the Kinni has two distinct sections each with very unique personalities. The Upper Kinni, the river upstream of River Falls, is known for an incredibly high number of trout per river mile and an over-abundance of overhanging branches. 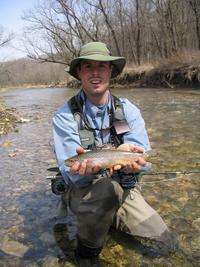 Although the hatches are intense, wading and fishing the upper river is difficult due to low gradient and a silt bottom. Rods no more than eight feet long are a necessity as the river seldom reaches twenty feet wide. The trout average around 10 inches although massive fish up to twenty-four inches do dwell below logs and undercut banks. As the Kinnickinnic continues toward the Saint Croix its gradient increases and it enters a limestone walled canyon downstream of River Falls. Accessible from Glenn Park in River Falls or the Kinnickinnic State Park eight river miles downstream, the Lower Kinni is a trout angler’s dream. With some hiking it is entirely possible to fish all day and not see another angler. Down here the numbers of trout per mile decrease to a respectable 3000 and the average size increases to twelve inches. Less common are the long flat stretches of the upper river, replaced with spectacular riffles, endless runs, and sapphire blue pools. A nine-foot four-weight rod is perfect for the Lower Kinni. Like many other American trout rivers the Kinnickinnic is in danger from encroaching urban development and agriculture. A beacon of hope, the Kinnickinnic River Land Trust is working to preserve the river’s natural character through land acquisition, broad community advocacy and building relationships with local landowners. With some luck and hard work the river will always remain the polished gem it is today. Accommodations are just down the street from the Land Trust’s office in River Falls at the Kinni Creek Lodge and Outfitter. More information on fishing the Kinnickinnic may be found at area fly shops including Bentley’s Outfitters, Summit Fly Fishing Company, Bob Mitchell’s Fly Shop and The Fly Angler.